The IEA's 2008 World Energy Outlook brewed a particular furore among the resource realist community. With petroleum prices on the run and all the ingredients of economic recession already in the pot, this report granted the world with a cornucopian vision of fossil fuels that was hard to square with reality. During the months that followed TheOilDrum thoroughly took on this report with multiple articles from various contributors. I was particularly intrigued with the CO2 emissions projections in this report. In the standard scenario atmospheric CO2 concentration was projected to reach 1 000 parts per million (ppm) by the end of the century, a near tripling in 100 years. I set out to construct a CO2 emission scenario based on technical fossil fuel extraction projections, and failed to get even to 500 ppm. However, the most fascinating result of that exercise was the relative imminence of a global CO2 emissions peak. Coal represents the largest underground stock of energy and the uncertainty on its ultimate size is high. Notwithstanding, following on the same growth path, a CO2 emissions peak by 2025 was only in reach to the most optimistic Coal extraction scenario. Such is the power of exponential growth. News of recent days remind again this reality. "Coal bust" is an expression employed to characterise a market that might not be merely conjunctural. Based on data CoalSwarm compiled of every coal plant proposed worldwide for the past five years as part of its Global Coal Plant Tracker initiative, the report finds that for every coal plant that came online, plans for two other plants were put on hold or scrapped altogether. The failure-to-completion rate was even higher, as much as 4 to 1, in Europe, South Asia, Latin America, and Africa, according to the report, which also says that the long decline in coal-fired energy production in the United States and the European Union can be expected to speed up in the near future. One of the facets of this market downturn is a stall in CO2 emissions from human activities. Naturally, this slowdown in the Coal market has much to do with struggling economies and recessive policies. But there is more to it than meets the eye. Throughout the past year, the weekly press review reported the increasing constraints to Coal mining in India. The reserves may be in place, but getting them to the surface and then generating affordable electricity is becoming increasingly harder. This is the very first reason for the outlandish nature of the forecasts issued by the IEA or the IPCC. Institutions like these simply assume the supply curve to be a flat line, demand may shift at will that prices hardly change for increased volumes extracted. 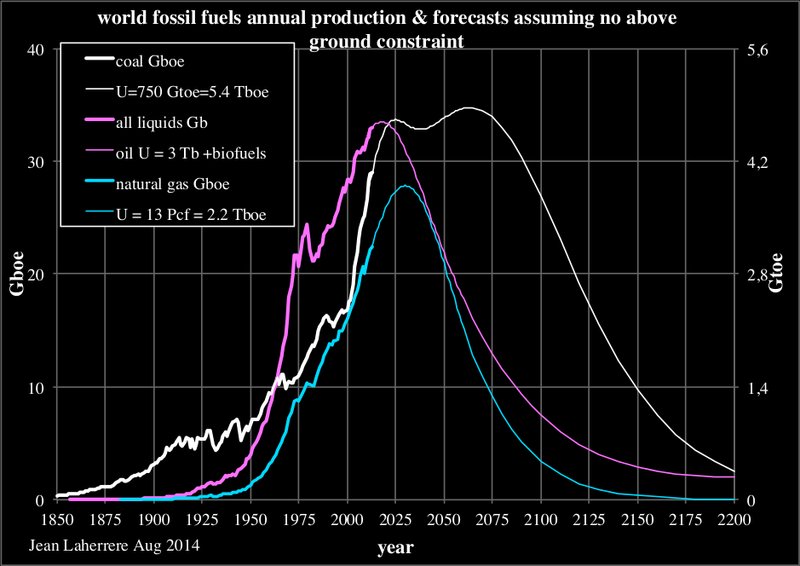 That way it is easy to forecast Coal extraction increasing 400% up to the end of this century. This is what Steven Kopits calls "demand side energy modelling", what a decade or so ago was know as "flat earth economics". I previously theorised on this subject, stressing that a resource supply curve is not flat, eventually rising with declining return-on-investment (EROEI in respect to energy). 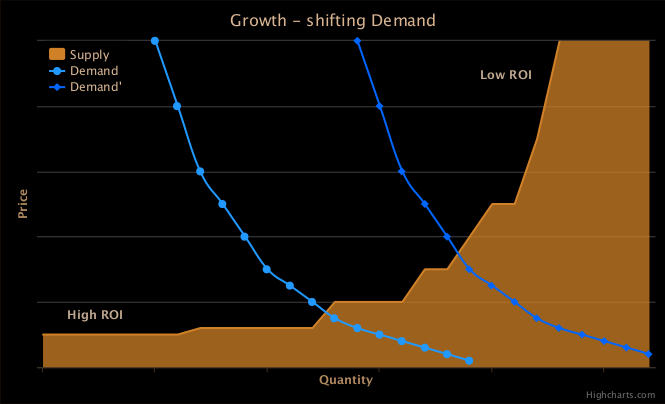 Supply as a function of return on investment, or EROEI in the case of energy resources such as Coal. In fact the problems lived in India echo elsewhere. The maturity of American Coal resources is showing, and the downturn is set to hit the US industry particularly hard. Sub-bituminous resources are becoming uncompetitive, especially in the international market; a period of contraction seems about, with relevant losses to many investors. Sub-bituminous resources are those of lower energetic content, i.e., those yielding the least EROEI. Close to 17% of forecast 2015 US coal production is at risk of idling or closure, totalling 162 million short tons (Mst), as these mine’s total cash costs plus sustaining capital expenditures exceed current market pricing, according to Wood Mackenzie’s latest coal market outlook. Wood Mackenzie says that the majority of the coal at risk is produced in Central Appalachia where approximately 72% of the total output is unprofitable. Years of declining productivity, thinning seams, increasing strip ratios, more stringent government regulations, and a high paid workforce have taken their toll and made Central Appalachia the highest cost region within the US. Other US regions also have substantial amounts of coal at risk, ranging from 47% of production in Southern Appalachia to a low of eight percent in both the Western Bituminous and Powder River Basin. In aggregate, this equates to approximately 14% of US thermal coal production and 58% of metallurgical coal production being at risk. Beyond declining energy content, other constraints to Coal extraction beg for deeper consideration. The extraction of Coal is an activity with particularly high environmental risks, that when left unmitigated can have a profound impact on public health and quality of life. China, where half of the Coal extracted in the world is burned, has been facing increasing impacts. The most known is the quasi-permanent smog endured in many of its cities. A less known stress put on fresh water resources is likely setting more pressing limits. Environmental impacts can be mitigated, but at the expense of EROEI. As an electricity staple, Coal is facing a competition that simply was not there just a decade ago. As an example, in the south of Europe, the cost of PV electricity is approaching 0.05 €/kWh. For countries lacking indigenous Coal resources, it is getting increasingly difficult to justify its import and the subsequent environmental mitigation. Even if 100% renewable electricity might not be a realistic short term target, the share of Coal in the energy mix of these regions has only one way to go: down. Returning to that old CO2 emissions exercise, it is important to stress how uncertain the future Coal extraction profile remains. Back then this uncertainty was portrayed with the graph bellow. Coal forecasts from 2007. The wide range shows clearly the uncertainty surrounding these models, however all peak in the first half of this century. These past few years Jean Laherrère modified significantly his Coal extraction scenario. In order to accommodate the extraction growth in China during the past decade, he anticipated the end of the growth trend to 2030, expecting a long plateau in the following decades. Jean's Coal ultimate estimate presently stands at 750 Gtoe. Instead of a well defined peak, Jean Laherrère now expects a long plateau in Coal extraction. In this screnario Coal stops compensating the decline of other fossil fuels by 2030. The Energy Watch Group (EWG) also revised its forecast, with a detailed country-by-country analysis. The German researchers went further, dissecting the Chinese market in its various regions. They did not find reasons to significantly increase the ultimate estimate, but now also expect an anticipation of the world peak. In contrast to the 2007 forecast, the EWG now estimates a sharp peak instead of a long plateau. The EWG expects the Coal ultimate to be 15% to 20% smaller than Jean Laherrère. 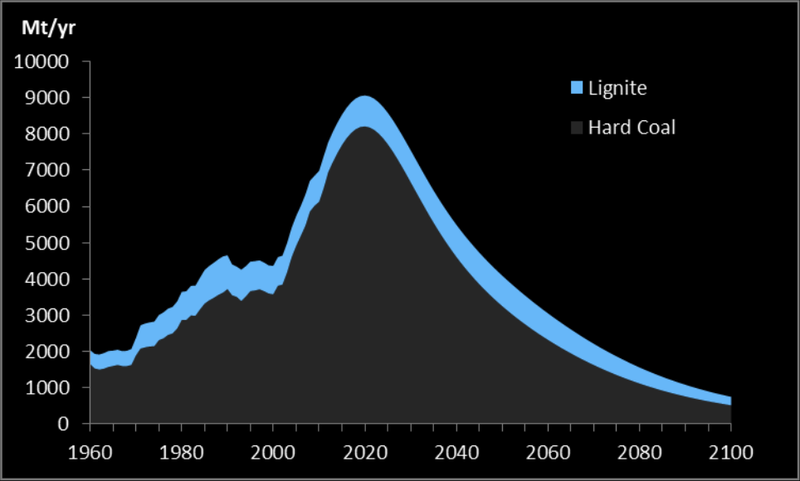 Their latest model yields a sharp peak soon after 2020, prompting a decline in global CO2 emissions almost immediately. But even this wide range of uncertainty can not possibly enclose the outlandish demand side models. Just to get to the lowest demand-side scenario the technical based models would have to more than double. Other studies concur in this assessment. Mikael Höök from the Global Energies Studies group in the University of Uppsala has been analysing the IPCC forecasts for some years, concluding that their business-as-usual scenarios are largely unattainable. Writing for the Nature journal, Richard Heinberg and David Firdley put in perspective the coming difficulties in extracting increasing amounts of Coal in an affordable manner. 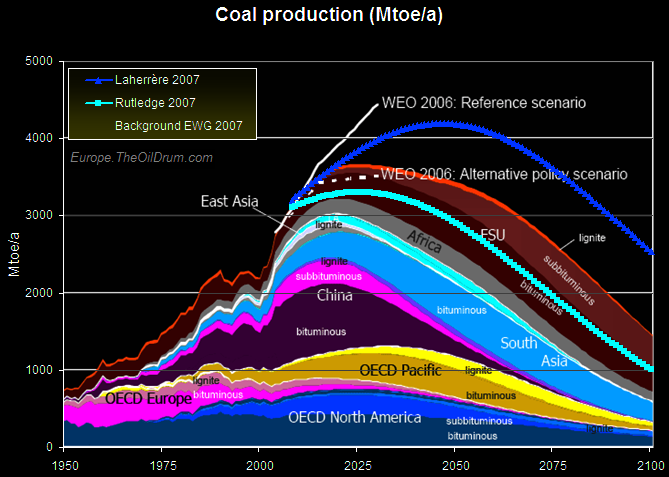 There is no reason to expect the Coal supply curve to be the flat line the IEA or the IPCC use in their models. A Coal peak might not be imminent, but expecting the extraction of this fossil fuel to continue growing a century more - dragging CO2 emissions up along with it - is totally surrealistic.